Golden, crispy and amazingly moist! 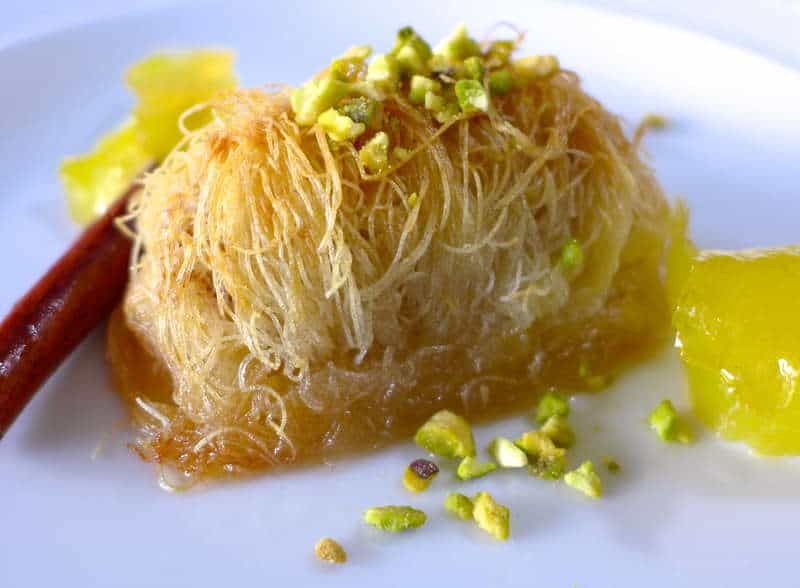 Kataifi is a delicious dessert which like baklava is very popular among Greek, Turkish and Middle Eastern nations. An amazing dessert made with roughly chopped walnuts (and sometimes other nuts), scented with ground clove and cinnamon, wrapped into buttered cripsy kataifi dough and bathed in lemon scented syrup.. Simply amazing! This is a very easy to follow Kataifi recipe for you to recreate this traditional sweet delight from scratch. (See also the preparation shots below.) The key for the most flavourful homemade Kataifi is to use good quality fresh butter for buttering. The authentic Greek Kataifi recipe calls for ‘galaktos’ butter made from cow’s milk, which really gives a unique flavour and amazing smell! Crispy Kataifi and right syrup-ing go together! To accomplish this make sure that the syrup is cold and your Kataifi is really hot. Always ladle really slowly the cold syrup over the hot Kataifi, enabling each ladle to be absorbed, so that the syrup is absorbed evenly. Even though it will be really hard.. you should wait for the Kataifi to cool down for a while before serving. It is very important to defrost overnight the kataifi dough from the freezer. To do that, the key is to leave defrost in the fridge and not at room temperature, in order to prevent it from getting soaked with water. If the kataifi dough gets soaked with water, it will be difficult to work with and will be less crispy, when baked. When it comes to buttering, don’t be thrifty! Drizzle with enough butter to help the kataifi dough bake and get a golden brown colour; plus extra flavour! Kataifi dough is actually shredded phyllo dough and dries out very quickly, so it’s best to keep exposure to air at a minimum. Uncover the plastic wrap, when you are ready to use it and when done preparing this kataifi recipe, put it straight into the oven. Work the dough gently with your hands on a large surface or over the sink, so that you don’t end up with a kitchen filled with scattered shredded dough! Cover the kataifi dough with a damp towel and keep it covered, while you prepare the kataifi rolls. So go ahead, give this traditional Kataifi recipe a try and amaze your friends and family! Oh and you can always read this delicious recipe in Greek here Παραδοσιακό κανταΐφι σιροπιαστό. To make this Kataifi recipe, start by preparing the syrup. Add all the ingredients for the syrup into a small pot and bring to the boil. As soon as the sugar has dissolved, the syrup is ready. Leave the syrup aside to cool completely. Prepare the filling for the Kataifi. In a blender add the walnuts, ground clove and cinnamon; pulse until the walnuts are roughly chopped (not powdered). Although the walnut filling is the most common, lots of kataifi recipes also add pistachios and almonds. So it’s up to you to decide. Unroll the Kataifi dough from the plastic sleeve. Work the kataifi dough with your hands, tearing apart the shreds and gently spreading the strands out a bit if they clump together, in order to get fluffy. Cover the Kataifi dough with a slightly damp towel. Take one piece of the kataifi dough, and spread it on a working surface or on your palm. Drizzle with melted butter and place 1 teaspoon of the filling at one end. Roll it up tightly, folding inwards the sides, to form a small cylinder. Place the kataifi roll in the pan and brush with melted butter, using the cooking brush to shape it a little bit. Repeat with the rest of the kataifi dough and filling. Place the kataifi rolls the one next to the other, leaving no gaps between them and drizzle with a little bit more butter. Bake the kataifi in preheated oven at 170-180C for about 1 hour (on the middle rack), until nicely coloured and crispy. As soon as you turn the kataifi out of the oven, ladle slowly the 3/4 of the cold syrup over the for kataifi, enabling each ladle to be absorbed. Cover the pan with a towel and set aside for 10 minutes. Ladle the rest of the syrup over the kataifi and wait until absorbed. Serve this delicious kataifi dessert with a full spoon of vanilla ice-cream. Enjoy! Why can’t your recipes have both temperature settings, F and C? Kataife doesn’t. Want to try this. I absolutely love it. Going to Greek festival today. Will see if they have the dough there. Otherwise where would I find it? This pastry haunts my dreams it is so wonderful. I want to try to make this. Unfortunately we are in the south and not much in the way of ethnic markets here, if any.